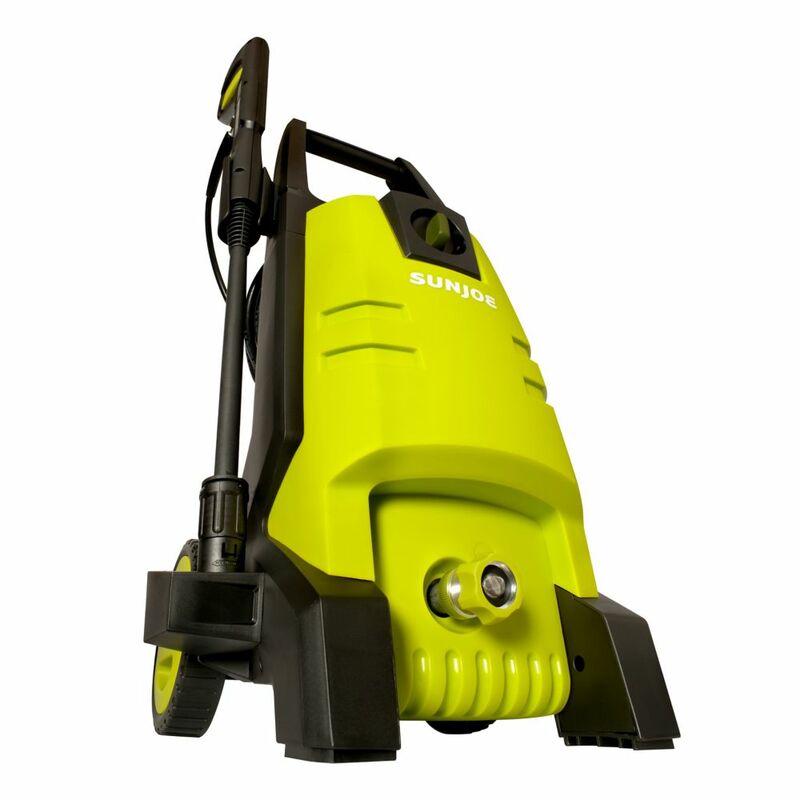 Packed with 13 amps of pure cleaning power, SPX2500 delivers a might blast - up to 1885 pounds of pressure per square inch and 1.59 gallons per minute - to demolish every last bit of dirt and get really clean, really fast. Simply twist the adjustable nozzle to go from intense jet to gentle spray and watch Sun Joe make light work of mildew, grease, oil, tar, mud, rust and more! And you'll always clean smarter, not harder with the SPX2500s built-in Total Stop System designed to save energy and prolong pump life. Tackle your toughest cleaning tasks with ease and Go With Joe. Karcher's 1,600 psi K2 Ergo pressure washer delivers strong cleaning power for jobs around the house. The adjustable, telescoping handle makes transport easy - reducing bending and strain. The Vario spray wand allows for quick adjustment between low and high pressure without the need to switch nozzles. For stubborn stains, the patented Dirtblaster spray wand will clean up the toughest chores. Pressure Joe 1885 PSI 6 LPM 13 amp Electric Pressure Washer Packed with 13 amps of pure cleaning power, SPX2500 delivers a might blast - up to 1885 pounds of pressure per square inch and 1.59 gallons per minute - to demolish every last bit of dirt and get really clean, really fast. Simply twist the adjustable nozzle to go from intense jet to gentle spray and watch Sun Joe make light work of mildew, grease, oil, tar, mud, rust and more! And you'll always clean smarter, not harder with the SPX2500s built-in Total Stop System designed to save energy and prolong pump life. Tackle your toughest cleaning tasks with ease and Go With Joe. Pressure Joe 1885 PSI 6 LPM 13 amp Electric Pressure Washer is rated 4.3 out of 5 by 22. Rated 5 out of 5 by Joe from Have used once. Worked great. ... Have used once. Worked great. Rated 5 out of 5 by Kerin from Delighted with our Sun Joe Our SPX2500 arrived the next day and so far has not disappointed! In fact we are delighted - it is far more suitable for our use than the Simoniz product it replaced; more versatile, much lighter and the adjustable nozzle much handier than the replaceable kind. Very pleased with our purchase. Rated 4 out of 5 by Fricker from SPX2500 Good product for the price. I purchased this unit because it had the adjustable wand nozzle pressure feature. I also like the wang shut off button feature. Rated 5 out of 5 by oldguy from Purchased to clean around the house. Tried a moderate job of cleaning the patio. Worked well no... Purchased to clean around the house. Tried a moderate job of cleaning the patio. Worked well no issues. took my time and it removed moss and dirt from paver bricks. Looks like a new patio. Now we will have to wait till spring. Its winter in Pa. Rated 5 out of 5 by wrf from I like the washer because of the ability to adjust... I like the washer because of the ability to adjust the wand spray pressure without having to change pressure tips. Also, I like the ability to "lock" the wand at the handle which is a good safety feature. There is also a power turn off switch on the unit. The build-in GFI on the electrical plug is a great safety feature. Rated 1 out of 5 by JPS from The pressure washer works well, but the pressure hose attachment to the gun comes loose as you wo... The pressure washer works well, but the pressure hose attachment to the gun comes loose as you work. I contacted the manufacturer about the problem and they quickly sent me a new pressure hose, but same problem. It is a design issue, not a faulty part. It says only a phillips screw driver is needed for assembly, so you are supposed to finger tighten this connection. Maybe if I use a wrench it would stay attached. As you wave the gun back and forth washing anything, the attachment of the hose to the gun loosens, water sprays out all over you and the pump starts to go on and off repeatedly due to water pressure loss. So you have to turn it off and retighten about every 2 minutes. I'm going to return it. Rated 4 out of 5 by Linda from Good Purchase to do our deck. It did a good job, certainly improved our deck. It does take time, as the nossel is narrow, so you have to be patient. This work good for small jobs around the house. only used twice so far no problem. Rated 5 out of 5 by Jerry 123 from Excellent Product I bought SPX 2500 to clean cement driveway,patio and barbecue.It did and excellent job cleaning all of them. It is a very good value for the money. No problems using or assembling .